All the Carniny Youth FC fixture activity was based around tournament action - at home and abroad - over the Easter period. Jason Hunter’s Under 13s enjoyed a huge success in Portugal when they went unbeaten in five games to win the 2015 Algarve Youth Cup. The two Under 10 teams were in action at the Larne Youth Soccer Sevens, with the Amateurs winning three from four games and the Youth team. The Under 14s picked up three points from their scheduled game with Warrenpoint on Friday evening whilst the U15s lost out to a strong Linfield team in their NIBFA Cup semi final. Both U11 sides lost out to Springfield in the Lisburn League and Coleraine in the NWCDYL. Tee off times have filled up fast for the club’s Golf Day this Friday 17th April. The event will be held at Galgorm Castle Golf Club with dinner afterwards in the Eagle Restaurant. Anyone who would like to book a tee off slot at the day please contact Jason Hunter on 07885899290. Tee off times are available from 12 – 4pm on the Friday. Carniny Under 13s went into the Euro Copa tournament in Portugal on a good run of league form and had high hopes of doing well. The tournament was full of Portuguese and English talent. Carniny’s opening game was against torunament favourites Louletano but a single Aidan Graffin goal decided the game in the Ballymena boys’ favour. In the second game, Carniny were cruising against Quarterense as they led 2-0 before a late goal for their opponents prompted a nervy finish before Carniny held on. Against Immortal DC in their third game, Carniny’s players were feeling the effects of tiredness but they managed to drain every ounce of energy from their bodies to win 4-3. Magee and a spectacular bicycle kick from Graffin had Carniny 2-1 ahead before an equaliser looked as though Carniny might drop their first points. But a Dawkins free kick forced an own goal and Graffin got his second before their opponents pulled it back to 4-3. Carniny’s group decider was against unbeaten Stakeford Juniors and again it was Graffin who opened the scoring. Magee got the second goal and the goal of the game came from Lynn with a great free kick near the end to make it 3-0. Carniny’s final game was against local side Guia. With the tournament already won and the football during the week taking its toll the performance was below their own high standards they had set during the week but they still managed to come out 1-0 winners with a great header from Benji Magee. An absolutely fantastic performance from the boys the whole week. They all gave 110 % and were rewarded for their efforts with five wins out of five to lift the Cup. This is the 2005’s third year of entering this competition and always a day which gives the boys a lot of football against unknown teams. AFter starting with a scorless draw against Crusaders, Carniny Amateurs’ first win was a 1-0 success over Carnmoney FDC thanks to a Magee goal. 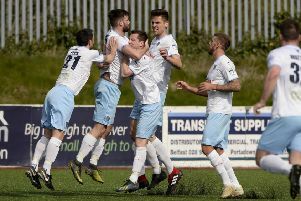 Goals from Graham and Magee gave Carniny a 2-0 win over Coleraine Olympic which was followed by a 2-1 win over Celtic Bhoys, with goals from Graham and an own goal. Carniny’s competition came to an end at the quarter-final stage when the tired side lost 2-0 to Oxford United. In preparation for their trip to play Rangers Academy next week, the under-10 squad had a fundraising day on Saturday. It started with a “friendly” game between the two U10 teams at Carnhill which ended in an entertaining 4-4 draw. A quick drive down to the Showgrounds saw them walk out to Broughshane, where they were kindly served some much needed refreshments and nourishment by The Thatch Inn. They then stopped for a photo opportunity with their other 2 local sponsors – John McNeill from McNeill Hardware and McAllister’s Butchers. Well nourished they made it back in quickly to be greeted by their own specially ordered Mr Whippy ice cream van for a well deserved cool down. Thanks as well go to all the local businesses that helped out the boys on the day. LIYL - Carniny Youth U-11 0, Springfield 2; NWCDYL - Carniny Amateurs 1, Coleraine Olympic 3; NIBFA National League - Carniny 1, Warrenpoint 0; NIBFA CUp semi-final - Carniny U-15 0, Linfield 4.